Plants & Flowers » Saintpaulia ssp. Saintpaulia ssp. is one of the most popular grown indoor plants, this low growing evergreen perennial has very attractive green scalloped slightly hairy leaves. Beautiful single or double flowers are produced through the year. These are available in a multitude of colours ranging from white to mauve, blue to purple,and light deep crimson-pink. Keep indoors, place in bright, indirect sun in a warm, moderately humid position. Perfect for small spaces, containers, window sills and bathrooms. Water when soil becomes dry to the touch, less so in winter. Regular liquid fertilizing will promote flowering. Remove spent flowers to encourage repeat blooming. Mist spray occasionally. 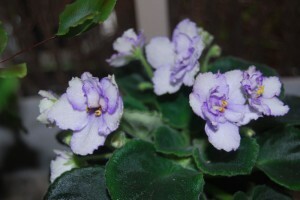 One of the most beautiful houseplants, Saintpaulia ssp. make your house appear prettier and also fresher, being one of the flowering plants able to combat air pollution. To propagate these plants, all you need is leaf cuttings. These beautiful plants are particularly susceptible to attack by mealybugs.